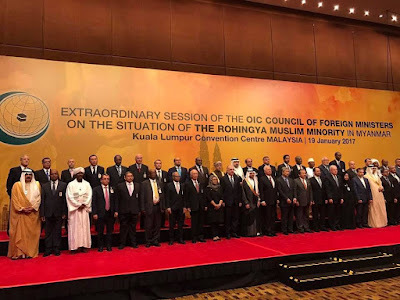 Najib urged the OIC, which groups 57 Muslim nations, to act to end the unfolding "humanitarian tragedy". In response, Myanmar, a mostly Buddhist country, said it was "regrettable" that Malaysia had called the meeting, and accused Kuala Lumpur of exploiting the crisis "to promote a certain political agenda" and disregard for the government's efforts to address it. "The Government has been endeavoring to safeguard lives and ensure the security of the people from the violent attacks of new extremists," said Myanmar's Ministry of Foreign Affairs in a statement printed in the country's state-run daily, the Global New Light of Myanmar. The ministry is run by Nobel Peace Prize winner and de facto leader of Myanmar, Aung San Suu Kyi, who won 2015 elections in a landslide after decades of pro-democracy struggle, ushering in Myanmar's first civilian government for about half a century. Myanmar authorities say the military launched a security sweep in response to what they say was an attack in October by Rohingya insurgents on border posts near Myanmar's border with Bangladesh in which nine police officers were killed. Kuala Lumpur summoned Myanmar's ambassador last year to protest against the treatment of Rohingya, breaking a tradition of non-intervention by members of the Association of South East Asian Nations in each other's affairs. Najib said it would be a disgrace if the Southeast Asian group did not do its utmost to "avert the catastrophe that has been unfolding". On Friday, a United Nations human rights investigator criticized Myanmar's operation and urged the military to respect the law and human rights.